My favorite activity is open water swimming across Lake Washington from Mercer Island to Seattle along the I-90 Bridge, or a swim across the cool and clear waters of Rattlesnake Lake, or the swim leg of a half or full Ironman Triathlon race. As distance swimming can be demanding, I am sensitive to make sure I am fully hydrated and have good electrolyte balance before these swims. Whether you are a competitive short or long course pool swimmer or a casual or competitive long course open water swimmer, attention to good hydration and electrolyte balance is essential not only to your enjoyment of swimming and peak performance, but also to muscle cramp prevention, health and safety. One of the biggest threats (and most silent) for swimmers is dehydration. Dehydration is an illness which causes extreme electrolyte imbalances in the body. It occurs when you do not take in enough fluids to replace what have been lost through sweat and urination. While dehydration is a danger during any sport of physical exertion, it is more so during swimming. This is true for two reasons. First, when you exercise, you sweat. When you are in the water swimming, you do not realize that you are still sweating losing fluid. Second, because you are surrounded by water, your brain is tricked to think you have all the fluid you need, and does not signal your mouth and throat to be thirsty. Maintaining good hydration is particularly important to competitive and distance swimmers as the continuity of good hydration is important to kidney health. Our kidneys play two very important roles. First, red blood cell production begins in our kidneys with the production of the hormone Erythropoietin. See Kidney Health, Red Blood Cell Production, Increased Blood Count and Peak Athlete Performance. Maintaining a good red blood cell count will directly impact our athletic performance, aerobic fitness and maximal oxygen consumption capacity(also called VO2 max). Second, our kidneys play a key role in electrolyte balance. Consistently maintaining good hydration habits will help keep your kidneys healthy and your life vigorous over the long term! We sweat while we swim the same as we sweat while we engage in land related sports and activities. However, because we are in water, we don't notice we are sweating while we swim. Dehydration can contribute significantly to fatigue and can be detrimental to swimming performance – not only physically, but also mental skills such as focus, technique skills, judgment and decision making can be adversely affected. In general, to determine how much water you should be consuming on a daily basis, divide your body weight by half. That is amount of water in ounces you should be consuming daily without exercise. Two hours before exercise, swimmers should consume 16 fluid ounces (or half a litre) of water or a sports drink to help hydrate them ahead of time. Swimmers should always bring a plastic drinks bottle with them to training sessions. Long-term, moderate to intense activity of 30 minutes or more requires periodic rehydration, such as the 8 fluid ounces (quarter of a litre) every 20 minutes. Another measure of adequate fluid intake is body weight. Athletes are recommended to weigh themselves daily prior to training so they can become aware of decreases in body weight due to dehydration. Athletes who are down 1-2% in body weight can be assumed to be dehydrated. Performance can suffer when a swimmer loses as little as two (2) percent of body weight as sweat. Average sweat losses have been estimated at 365ml/hr and 415 ml/hr for female and male swimmers respectively, with sweat losses greater during the anaerobic threshold sessions than aerobic sessions. A post swim hydration is important to recovery. What is the Function of Hydration and Electrolytes? Our body composition is 66% water. Fluid and electrolyte balance is a major function of homeostasis, which is our bodies ability to maintain its internal environment as it adjusts to challenges and stress. To the extent our bodies are able to adjust to these challenges the state of good health is maintained. Proper hydration and electrolyte balance is important for cellular metabolism, blood flow and therefore physical and athletic performance. All known higher lifeforms require a subtle and complex electrolyte balance between the intracellular and extracellular fluids. The maintenance of precise osmotic gradients of electrolytes is important. Such gradients affect and regulate the hydration of the body as well as blood pH, and are critical for nerve and muscle function. Electrolytes are molecules capable of conducting electrical impulses and include Sodium (Na+), Potassium (K+), Calcium (Ca2+), Magnesium (Mg), and Chloride (Cl). 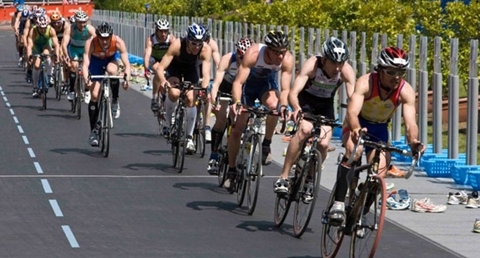 It is a good strategy to be in electrolyte balance prior to your swim, race or competition! Here is a list of natural food sources of electrolytes to include in your diet the week leading up to your swim. It's a good idea to take a salt pill with water at the onset of cramping. This might quickly stop the cramping. 1. Cold Water Hydration. Surprisingly, dehydration is also a cold water hazard. Our body's metabolism is revved up more so in cold water as the body strives to maintain a health core body temperature. More hydration is needed water when swimming in cold water. The onset of dehydration often times is the cause of hypothermia. Hypothermia is very possible during endurance swimming or long pool sessions in cold or cool water. 2. Warm Water Hydration. The debilitating effects of heat stress on the ability to perform prolonged strenuous exercise are well established. During exercise in a hot environment, a substantial rise in body core temperature is often linked with the onset of fatigue and dehydration. Fluid replacement before and during prolonged swimming in the warm water has been shown to be effective in reducing the elevation of body temperature and in extending swimming endurance capacity. Long swims in a wetsuit in too warm water can cause the body to overheat more quickly. Recent studies show that ingestion of a cold drink before and during exercise in the heat reduced physiological strain (reduced heat accumulation) during exercise, leading to an improved endurance capacity. Exercise time was longer with the cold drink than with the warm drink, as the cold drink lowered heart rate, lowered skin and core temperature. Drinking cold drinks during exercise also reduced the need to sweat, resulting in a longer sweating capacity. When swimming in very warm water, the combination of the external heat and the internal heat produced from the exercise, heat within the body can build causing Hyperthermia which is having a core body temperature that is too high. Maintaining good hydration can reduce the onset of Hyperthermia as good hydration enhances sweating which acts to cool core body temperatures. In 2010, world class swimmer Fran Crippen, 26, died of a heat stroke induced heart attack near the end of the 10-kilometer race off the shore of the United Arab Emirates. High water temperatures were attributed to his death, with several swimmers complaining of dehydration and disorientation. 3. Rough Water Conditions. Rough water conditions including wind, tide and current related water conditions require greater physical swimming output and thus greater hydration needs. 4. Salt Water Swimming and Hydration. There is some belief that swallowing salt water while swimming in the oceans can quicken dehydration because salt water is saltier than your blood. As a result, water will leach osmotically from your circulatory system into the digestive spaces in order to achieve balance by diluting the salty water in your digestive tract. This removal of water from your circulatory system and the tissues it serves will more quickly cause dehydration. I've not seen findings that swimming in salt water by itself will quicken dehydration.